How many times have you heard your flute students play sharp when the dynamic is forte and flat when the dynamic is piano? I’m pretty sure it is one of those examples where you would say, “If I had a nickel for every time I heard……., I’d be rich”. So how can you help your students learn to play in tune regardless of the dynamic marking? The answer lies in helping them understand how to change the direction of the air at the different dynamic levels, rather than rolling in and out, as is commonly taught in school music programs. The first aspect you need to address with the students is developing a consistently fast air stream regardless of the quantity of air one is blowing. I explain it by saying that when we first start playing, air speed and quantity are like a married couple going hand in hand. Air speed and air quantity need to get a divorce, go their separate ways. The air speed (and the size of the aperture) is pretty consistent regardless of dynamic or register. What changes with different dynamics is the quantity of air and the direction of the air stream. How can you teach this kind of steadiness of the speed of the air stream? I like slow melodies (like the chorales so many bands use to warm up), Remington intervals and slow scale exercises. Pay particular attention to not just blowing on the notes but blowing between the notes. 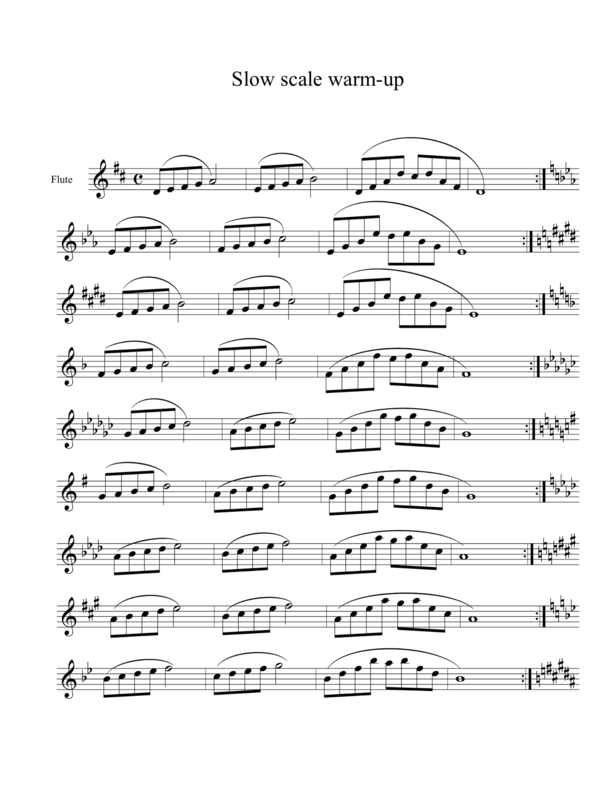 Here’s an example of a simple scale exercise you can use with all your winds. You can adapt it for keys your students know and/or use it for teaching unfamiliar keys (for flutes in band, that would be sharp keys). I believe the only way you can really learn to blow with steady air is to play slowly. Finger technique is a distraction to learning to blow steadily, so remove it and encourage your students to pay attention to how the air moves through the line and between the notes. Secondly, the guidelines for staying in tune through all dynamics are for loud dynamics, blow down more by reaching forward with the top lip, and for soft dynamics raise the air stream by pushing the bottom lip out more. Remember Independence for Lips? Getting good control of the direction of the air takes attentiveness and practice. Here is an exercise I recommend doing with a tuner. First, have the student establish a good baseline pitch for the given note at mezzo forte. Then have them start the same note as softly as possible, with a light and fast air stream, gradually get louder and then diminuendo again while maintaining the pitch center. Do this exercise first with a tuner, but with more experience, try it by ear to further train your ear. Finally, have the student try diminuendos of different lengths, first longer duration and then gradually shorter note values. Helping your students learn to play in tune at any dynamic level is about making sure they understand the necessary physical skills and helping them developing their ears. If you find these entries useful, please subscribe, share with your colleagues and come back regularly for more flute tips. Feel free to comment. If you have a topic you would like to see explored more fully, you can contact me via IM/Messenger on Facebook or email me at dr_cate@sbcglobal.net. For information about clinics and workshops click here. What you have outlined ties in well with the Moyse tone exercises and the sets that Trevor Wye has for working on tone. Even beginners can get the idea of getting a really good sound from a long tone on “B” and then keeping that good sound on other pitches around there. Lots of times you see the lightbulb go on when they hear themselves make that really good sound. Like on any instrument, the good sound is what hooked the student into that instrument to begin with, so if they can make “that sound”, even on one pitch, they will keep practicing to hear it more. © Dr. Cate Hummel and Dr. Cate’s Flute Tips, 2014-2017. Unauthorized use and/or duplication of this material without express and written permission from this site’s author and/or owner is strictly prohibited. Excerpts and links may be used, provided that full and clear credit is given to Dr. Cate Hummel and Dr. Cate’s Flute Tips with appropriate and specific direction to the original content (link back to Dr. Cate’s Flute Tips).